Finall did the shovel chop on my 94 Katana 600. It took over 2 hours to do the mod, but I feel it was well worth it. It took longer than I thought it would, due to the fact that the metal frame under the fender had to be cut to, not just the plastic fender. Looking to mod, Any ideas? did you integrate the blinkers also or did they just disappear? Nice! I want to do this to my 94 600 also...Did you leave a little of the plastic to mount the plate to? Also, where did you get the little license plate lights from? I like your seat coverings. Where are those from? "If you're gonna be a turd, go lay on the lawn." The plate bolts are from walmart for about $4. The vinyl for the seat, I got from www.yourautotrim.com. It is carbon fiber vinyl. It is thick and difficult to work with, take it to an upholsterer. I left about 2inches on the rear to attach the plate to. No signals yet. 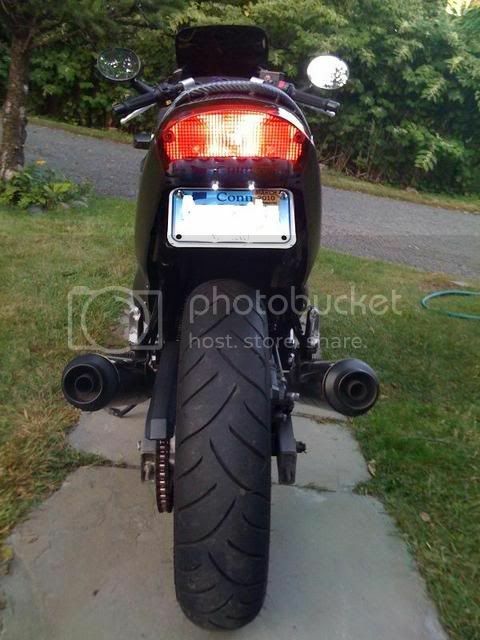 I will be getting the LP license plate mounted turn signals and hooking them to the bottom plate holes. good job, did you integrate your rear signals into the tail light as well? Nope, I did not integrate the signals yet. 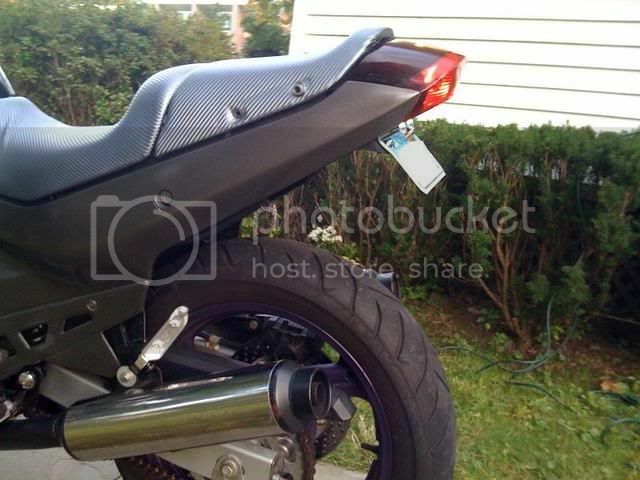 I plan on getting the license plate mounted turn signals from Lockhart Phillips. Then I will have turn signals again. Nice clean job. You did good. 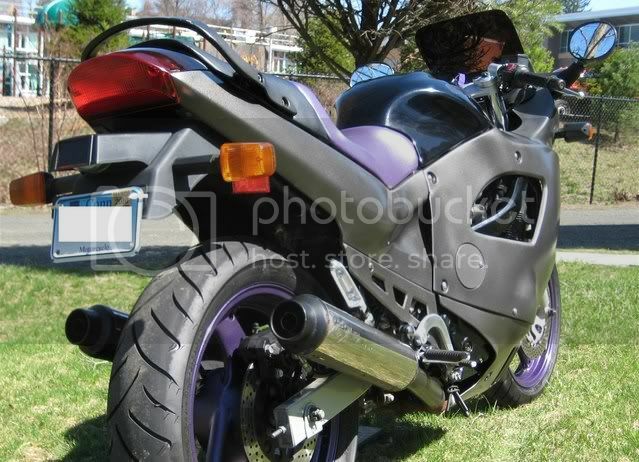 bike looks good , im wondering if its legal to have the blinkers inside the tail lite? anyone have any idea? No, it's not. There is a size and distance requirement in almost every state. However, if they are clearly visible, it's usually not an issue, and it's not an offense they can pull you over for. It's a secondary offense, not a primary to my knowledge. The bike looks good. Very clean. I want to integrate my tail lights also. 2001 White White...Carbon Fiber Mirrors. Yosh RS3 Exhaust...Blue/Black Extendable Cluth/Brake Levers...Blue 6pc. LED Underbodies. Blacked Out Windscreen...Spiked Bar Ends. At or near the front—1 amber on each side of the vertical centerline at the same height, and having a minimum horizontal separation distance (centerline of lamps) of 16 inches. Minimum edge to edge separation distance between lamp and headlamp is 4 inches. At or near the rear—1 red or amber on each side of the vertical centerline, at the same height and having a minimum horizontal separation distance (centerline to centerline of lamps) of 9 inches. Minimum edge to edge separation distance between lamp and tail or stop lamp is 4-inches, when a single stop and taillamp is installed on the vertical centerline and the turn signal lamps are red. I think where these companies get a way with the integrated turnsignals is the final sentence (in blue) which negates the 4 inches from the stop lamp requirement as long as the turn signals are amber. It seems to imply that the 9 inch separation only applies if the turn signals aren't integrated.